// You matter. You make a difference when you sponsor a child or teenager for Winter Camp. Camp not only impacts them for one weekend, but impacts them for the rest of their lives. 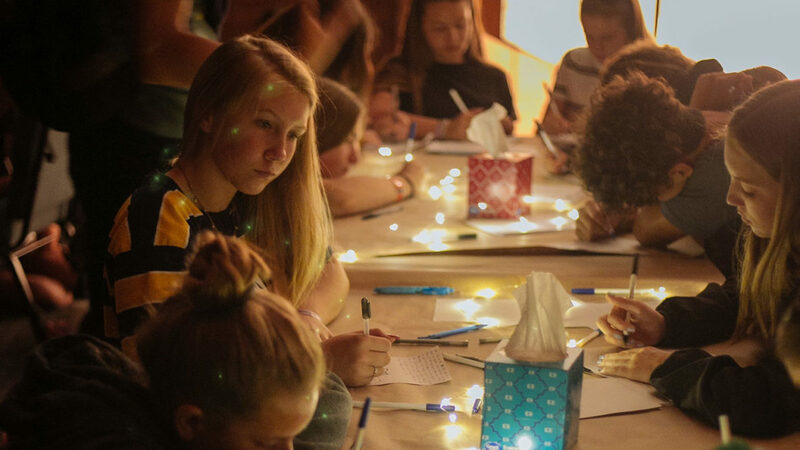 When teenagers come to camp, they often come burdened by hard experiences from home, school, or their circle of friends, and they wonder why this is happening to them. At camp, they hear a message about a savior who came to set them free from the negative thoughts and self-shame that plague their minds, and become overwhelmed with the loving truth that there is someone in their lives that love them — Jesus Christ. I am living proof that camp can change a young person forever. I was sponsored by a church member to go to camp every year, and because of that, I was set with a vision and foundation for my life to be devoted to Jesus Christ for all eternity. When you sponsor a child of the world to go to camp, he comes back transformed as a child of God. His experience of going to camp, and learning Jesus’ unconditional love for him, carries on to his children’s children. He comes back wanting to serve in our church and our community, wanting especially to serve his peers, and love them like Jesus Christ would. He becomes deeply rooted in the God’s Word and loves others like no one else has ever loved him before. 1. You can financially sponsor a young person to go to camp by sending a check of any generous amount to Shepherd’s Grove or Irvine Presbyterian Church. 2. You can partner with us by praying for the younger generation to be financially, spiritually, and emotionally prepared to encounter a relationship Jesus Christ through camp. 3. If you have children or grandchildren, or know a teenager that needs to know they are loved by God, invite, sponsor, or register them to experience a radical weekend, consisting of engaging Christ-centered messages, worship, sky trail, giant swing, ziplining, laser tag, crazy games, and a dance party that will change their lives forever. WINTER CAMP 2019 | Ready to sponsor? Here are the details. Thank you for taking the time to read my article. We here at Shepherd’s Grove and Irvine Presbyterian Church believe that you matter, and make a difference, when you are praying, inviting, sponsoring, or sending a teenager to camp. You are helping in growing the future kingdom of God. You matter to us. God loves you and so do we.